Like many, my favorite subject in high school mathematics was geometry. This was probably the case because it was one of the few subjects where I was able to directly visualize everything that was going on. I find that I am prone to thinking in pictures or “visual analogies”, because this enables me to understand and remember concepts better. Solutions to certain problems may then become obvious. I’ve illustrated this kind of thinking on a couple occasions on this blog when addressing plasmons, LO-TO splitting and the long-range Coulomb interaction and also when speaking about the “physicist’s proof”. In this case, when measuring , we find that the probability of finding the particle in the spin-up state will be . Hence the probability of measuring is now increased to , whereas it was only before measuring . It is important to note that the ratio of the probabilities, , and the relative phase between the and the kets does not change after the projection. I find this solution to the problem particularly illuminating because it permits a visual geometric interpretation and is actually helpful in solving the problem. Please let me know if you find this kind of visualization as helpful as I do, because I hope to write posts in the future about the Anderson pseudo-spin representation of BCS theory and about the water analogy in electronic circuits. I recently watched an interesting documentary on Krakatoa, which is what inspired this post. Furthermore, inaudible (to the human ear) acoustic signals were said to have circled the earth up to seven times, and were detected using infrasonic detection. Reports suggest that the sound level of the eruption was approximately a whopping 175 dB at 100 miles from the volcano. Sound intensity falls as . where is is the threshold of human hearing, is the coefficient of sound absorption in and is the distance in . I have plotted three curves: the blue curve is a calculation that does not consider any damping from air at all, the yellow curve considers a low but audible frequency sound that includes damping, while the green curve considers an infrasonic sound wave that also includes damping. 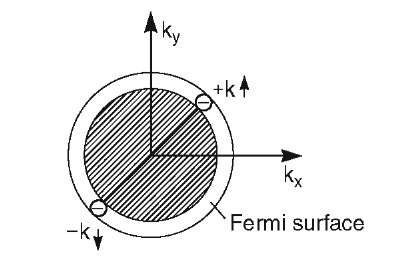 (The damping coefficient was obtained from this link assuming a temperature of 20C, pressure of 1atm and humidity of 75%). Close to the volcano, this calculation gives us an unrealistically large value for the sound level. It turns out that sound cannot exceed ~194dB because this is the sound level at which rarefaction of air corresponds to a vacuum. Values greater than this correspond to a shock wave. Keeping these things in mind, the yellow curve probably is the best estimate of the sound level on Rodrigues Island, since it includes damping for an audible signal (humans can’t hear below about 20 Hz). Therefore, we can estimate that the eruption was heard with about 70 dB on Rodrigues Island! This is approximately the sound level of a noisy restaurant. If we follow the yellow line to about the 40 dB mark, which is an approximate value where someone may still notice the sound, this would be at a distance of about 4,800 miles! This is approximately the distance from Cape Town, South Africa to Baghdad, Iraq. The last point to address is the seven-time infrasonic global circumnavigation. It turns out that if one follows the green line on the plot out to where it reaches the 0 dB level, this would be approximately at a distance of about 11 million meters. The earth’s circumference is approximately 40 millions meters, however, and if we were to circumnavigate the world seven times, the required distance of travel would be 280 million meters. What went wrong in the calculation? There is one major factor to consider. 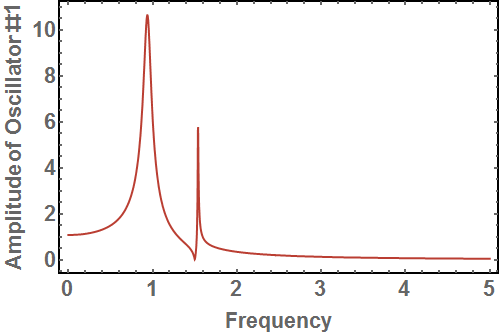 Very low frequency sound basically propagates with very little damping through air. For sub-Hz infrasonic sound, values for the absorption coefficient don’t seem to be very easy to find! (If you know of a database for these, please share and I’ll update this post). Let us then consider the case of no damping (the blue curve). The blue curve actually crosses the 0 dB mark at a distance of approximately 85 trillion meters. This way over-steps the mark (corresponding to circumnavigation 2.125 million times!). Even though this is a ridiculous estimate, at least it beat the 280 million meter mark, which suggests that with the right absorption coefficient, we may be in the right ballpark. A quick calculation shows that for realistic values of the absorption coefficient (about half the value of the 5Hz sound absorption coefficient), we would be very close to the 280 million meter mark (in fact, I get about 225 million meters for this absorption coefficient). This tells us that it is indeed possible for low frequency sound to circumnavigate the planet this way! 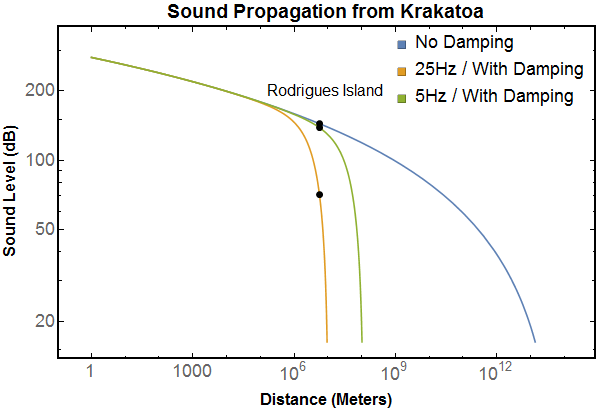 Interestingly, we can learn quite a bit concerning the sound propagation of the Krakatoa eruption using relatively simple physics. Note: Throughout, we have neglected one very important effect — that of reflection. Anyone who has been inside an anechoic chamber will be acutely aware of the effects of sound reflection. (In an anechoic chamber, one can actually stand at different spots and hear the interference pattern when playing a sine wave from a pair of speakers). Even with this oversight, it seems like we have been able to capture the essential points, though reflection probably had a non-trivial effect on the acoustic propagation as well. Why Was BCS So Important? BCS theory, which provides a microscopic framework to understand superconductivity, made us realize that a phenomenon similar to Bose-Einstein condensation was possible for fermions. This is far from a trivial statement, though we sometimes think of it as so in present times. A cartoon-y scheme to understand it is in the following way. We know that if you put a few fermions together, you can get a boson, such as 4-helium. It was also known well before BCS theory, that one gets a phenomenon reminiscent of Bose-Einstein condensation, known as superfluidity, in 4-helium below 2.17K. The view of 4-helium as a Bose-Einstein condensate (BEC) was advocated strongly by Fritz London, who was perhaps the first to think of it in such a way. Even if the individual atoms were fermions, one would then predict that if this bosonic diatomic gas molecule could remain in the gas phase all the way down to low temperature, that at some point, this diatomic gas would condense into a BEC. This idea is correct and this is indeed what is observed. 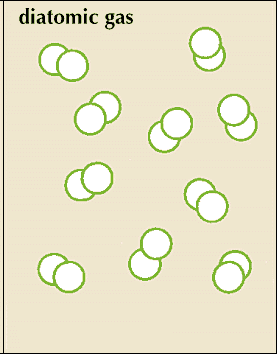 Here the “diatomic molecules” are overlapping, and it is not easy to see which atoms are paired together to form the diatomic molecule, if one can even ascribe this trait to them. In this case, it is no longer simple to see whether or not BEC will occur and indeed if there is a limit in distance between the molecules that will necessarily give rise to BEC. This is the question that BCS theory so profoundly addresses. It says that the “diatomic molecules” or Cooper pairs can span a great distance. In superconducting aluminum, this distance is ~16,000 Angstroms, which means the Cooper pairs are wildly overlapping. In fact, in this limit, the Cooper pair is no longer strictly even a boson, in the sense that Cooper pair creation and annihilation operators do not obey Bose-Einstein commutation relations. However, the Cooper pair can still qualitatively thought of as a pseudo-boson that undergoes pseud0-BEC, and this picture is indeed very useful. It enabled the prediction of pseud0-BEC in neutron stars, liquid 3-helium and ultra-cold fermionic gases — predictions which now have firm experimental backing. An interesting note is that one can study this BCS-to-BEC crossover in ultracold Fermi gases and go from the overlapping to non-overlapping limit by tuning the interaction between atoms and I’ll try to write a post about this in the near future. So while BCS theory has many attributes that make it important, to my mind, the most profound thing is that it presents a mechanism by which weakly interacting fermionic pairs can condense into a pseudo-BEC. This is not at all obvious, but indeed what happens in nature. Update: In light of the description above, it seems surprising that the temperature at which Cooper pairs form is the same temperature at which they seem to condense into a pseudo-BEC. Why this is the case is not obvious and I think is an open question, especially with regards to the cuprates and in particular the pseudogap. There is an excellent pair of papers here and here demonstrating the existence of a Rydberg series of excitons in Cu O, a material that has long been the poster child for observing excitons. The data in both papers are pretty stunning — in the first one, they see a Rydberg series up to n=25! In the second, they see higher angular momentum ( -like and -like) excitons apart from the usual -like excitons. Excitons can occur in semiconductors and insulators and are the result of the Coulomb interaction between electrons and holes. For those familiar with superconductivity, an exciton, in many ways, bears a qualitative resemblance to Cooper pairs, except here the quasi-particles are of opposite charge. Hence, the binding between the electron and hole arises from the usual attractive Coulomb interaction. However, it helps to think of the exciton (similar to Cooper pairs) as possessing a center of mass wavefunction and a relative wavefunction. where is the reduced mass of the electron-hole system, is the proton mass, and is the hydrogenic Rydberg. It turns out that this perfectly spherically symmetric model does not encapsulate completely the exciton in a solid, however, because the potential in a crystal is not perfectly rotation-symmetric. Because of the lattice, the “angular momentum” of the exciton cannot be labeled using an , etc. kind of scheme and we must resort to some group theory. For the case of Cu O discussed in the papers above, the symmetry of the crystal is cubic — therefore the symmetry is still relatively high. However, because continuous rotational symmetry is broken, the light used to detect the excitons in this experiment are no longer forbidden from exciting -like and -like excitons and it is remarkable that they are observable! Even though the observations in these papers can be accounted for in a quite simple theoretical framework, the experimental results are nonetheless quite elegant and remarkable. As an interesting aside, the reason that this experiment is possible is because of the extreme purity of the Cu O crystals used for these studies. It turns out the cleanest of these samples are naturally-occurring, rather than man-made. Therefore, when solving the Cooper problem, one goes from working in a 3D solid sphere (the entire Fermi sea), to working on the surface of the sphere, effectively a 2D manifold. Because one is now confined to just the surface, it enables one of the most crucial steps in the Cooper problem: assuming that the density of states ( ) at the Fermi energy is a constant so that one can pull it out of the integral (see, for example, equation 9 in this set of lecture notes by P. Hirschfeld). Note that this is exactly the same function that appears in the solution to the Cooper problem, and this is of course not a coincidence. This function is not expandable in terms of a Taylor series, as is so often stressed when solving the Cooper problem and is therefore not amenable to perturbation methods. Note, also, that there is a bound state solution to this problem whenever is finite, again similar to the case of the Cooper problem. That there exists a bound state solution for any no matter how small, is only true in dimensions two or less. This is why reduced dimensionality is so critical to the Cooper problem. Furthermore, it is well-known to solid-state physicists that for a Fermi gas/liquid, in 3D , in 2D const., while in 1D . Hence, if one is confined to two-dimensions in the Cooper problem, one is able to treat the density of states as a constant, and pull this term out of the integral (see equation 9 here again) even if the states are not confined to the Fermi energy. This of course raises the question of what happens in an actual 2D or quasi-2D solid. Naively, it seems like in 2D, a solid should be more susceptible to the formation of Cooper pairs including all the electrons in the Fermi sea, as opposed to the ones constrained to be close to the Fermi surface. If any readers have any more insight to share with respect to the role of dimensionality in superconductivity, please feel free to comment below. The reason I chose the first two papers was because a couple peaks in their respective spectra exhibit a Fano lineshape as a function temperature. In the Raman paper, after the charge density wave gap in the single-particle spectrum opens up, the lineshapes of the phonons are no longer Fano-like, but become Lorentzian. This indicates that the Fano lineshape likely resulted from strong electron-phonon coupling. The first oscillator was chosen to have a natural resonance frequency of 1, while the second oscillator was chosen to have a resonance frequency of 1.5. You can see that this is not exactly where the peaks show up, however. This is because of the level repulsion due to the coupling between the two oscillators. Now the $64k question: why does the asymmetric lineshape appear? Well, there are a few ingredients. The first ingredient is that the first oscillator is being driven by an extrenal source and the second oscillator is not. Secondly, there is a strong coupling between the first oscillator and second one. As one decreases the coupling between the two, the amplitude of the second (asymmetric) peak starts to shrink. Thirdly, the natural frequencies of the oscillators need to be relatively close to one another otherwise again the second peak decreases in amplitude. What is remarkable is that this simple coupled oscillator model is able to exhibit the Fano lineshape while serving as a very instructive toy model. 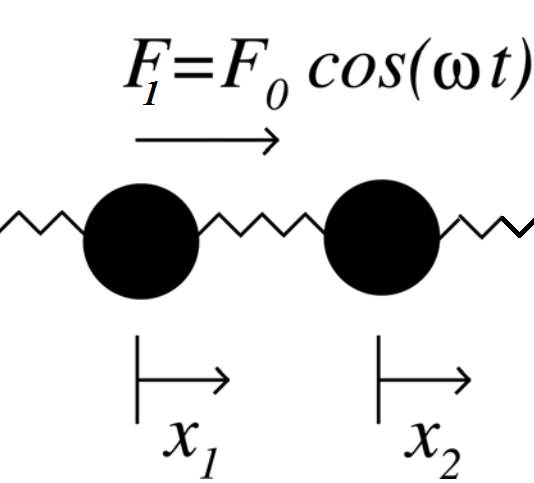 Because of this simplicity, the Fano lineshape is extremely general and is used to explain data in a wide variety of contexts across all areas of physics. A spectroscopist should always keep a look out for an asymmetric lineshape, as it is usually the result of a non-trivial coupling or interaction with another degree of freedom. Ever since the series of posts about the Theory of Everything (ToE) and Upward Heritability (see here, here, here and here), I have felt like perhaps my original perspective lacked some clarity of thought. I recently re-read the chapter entitled Physics on a Human Scale in A.J. Leggett’s The Problems of Physics. In it, he takes a bird’s eye view on the framework under which most of us in condensed matter physics operate, and in doing so, untied several of the persisting mental knots I had after that series of blog posts. The basic message is this: in condensed matter physics, we create models that are not logically dependent on the underlying ToE. This means that one does not deduce the models in the mathematical sense, but the models must be consistent with the ToE. For example, in the study of magnetism, the models must be consistent with the microscopically-derived Bohr-van Leeuwen theorem. When one goes from the ToE to an actual “physical” model, one is selecting relevant features, rather than making rigorous approximations (so-called physical approximations). This requires a certain amount of guesswork based on experience/inspiration. For example, in writing down the BCS Hamiltonian, one neglects all interaction terms apart from the “pairing interaction”. Leggett then makes an intuitive analogy, which provides further clarity. If one is building a transportation map of say, Bangkok, Thailand, one could do this in two ways: (i) One could take a series of images from a plane/helicopter and then resize the images to fit on a map or (ii) one could draw schematically the relevant transportation features on a piece of paper that would have to be consistent with the city’s topography. Generally, scheme (ii) will give us a much better representation of the transportation routes in Bangkok than the complicated images in scheme (i). This is the process of selecting relevant features consistent with the underlying system. This is usually the process undertaken in condensed matter physics. Note this process is not one of approximation, but one of selection while retaining consistency. With respect to the previous posts on this topic, I stand by the following: (1) I do still think that Laughlin and Pines’ claim that certain effects (such as the Josephson quantum) cannot be derived from the ToE to be quite speculative. It is difficult to prove either (mine or L&P’s) viewpoint, but I take the more conservative (and what I would think is the simpler) option and suggest that in principle one could obtain such effects from the ToE. (2) Upward heritability, while also speculative, is a hunch that claims that concepts in particle physics and condensed matter physics (such as broken symmetry) may result from a yet undiscovered connection between the two realms of physics. I still consider this a plausible idea, though it could be just a coincidence. Previously, I was under the assumption that the views expressed in the L&P article and the Wilzcek article were somehow mutually exclusive. However, upon further reflection, I no longer think that this is so and have realized that in fact they are quite compatible with each other. This is probably where my main misunderstanding laid in the previous posts, and I apologize for any confusion this may have caused.